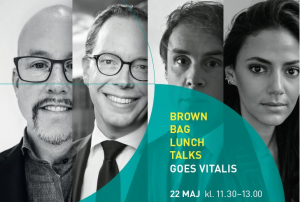 Brown Bag Lunch Talks and Vitalis summer party 22 May. Vitalis traditional three course dinner is long gone, and replaced with a summerparty. We offer you an evening event where you can meet and network together with conference delegates , lecturers, fair visitors and exhibitors at the Swedish Exhibition Center. The evening starts at 7 pm with a glass of sparkling at restaurant Seasons before we move on high up on Heaven 23. There will be a buffet, drinks and entertainment of various kinds. There will also be a DJ playing for those who want to dance. Kalle Conneryd Lundgren – Karolinska University Hospital, with more. We think that the biggest challenges in healthcare will resolve best by discussions between industry, researchers politicians and healthcare. We are inviting you to come and discuss the situation with us and to think of idea’s on how to improve the dialogue, and off corse the lunch is on us! There are limited numbers of places. We hope to se you 22 May at 11.30am – 1pm!